Darkness Shining Wild is an investigation of sanity, suffering, identity, death, and the far frontiers of spirituality, centered around the story of an extremely harrowing near-death experience I endured. The ultra-hellish journey following that experience provides a jumping-off point for deep-diving reflections on topics ranging from the anatomy of dread to the relationship between madness and spirituality. 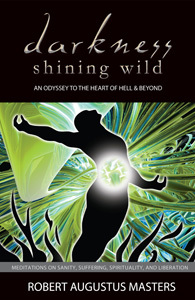 The odyssey to the heart of hell and beyond that centers Darkness Shining Wild provides not a consoling cartography of the transpersonal, but rather a reality- unlocking tour of the everwild Mystery of Being, in which revelation supplants explanation. Darkness Shining Wild is for everyone who is interested in authentic awakening, and is especially suited for those who, having left the shores of the status quo, are discovering that the waters they are crossing have no obligation to remain benign or comfortable. It may also inspire those who, despite having done considerable psychospiritual work, nonetheless find themselves stuck or plateau-ing or "sinking" into darkness. Darkness Shining Wild is dedicated to those whose longing to be truly free is stronger than their longing to be distracted from their pain. "An absolutely extraordinary book. I think you really have offered something to the spiritual literature, an insight into the difficulty of the extraordinary vistas of the path that has never been written before....You've done a hell of a job writing about the hell that is a foundation for heaven. I don't know how many people will be able to understand everything that you're saying, or even half of what you're saying, but for those that do it may be a Godsend. I think you're going to have some extraordinary responses to this book, because in a sense you're letting the cat out of the bag. You've really underlined the necessity to know hell from the inside, in order to be able to sustain heaven. I absolutely recommend Darkness Shining Wild. It's a remarkable book long waited for." "Many people who have had breakdowns of psychotic proportions have subsequently undertaken deep spiritual work. We have some powerful first person accounts of people who made this voyage into madness and then returned spiritually awakened. But Dr. Masters is the first I know of to take the plunge with a spiritually attuned consciousness and return to write about it….This is not a romanticized Dark Night's Journey. Dr. Masters captures the terror people in these states experience, even when versed in the world's accumulated stock of spiritual wisdom. The story of his odyssey is a naked dance of spirit, with mind in its most wild wandering untamed form." — David Lukoff, professor of Psychology at Saybrook Graduate School and co- developer of the DSM-IV category "Religious or Spiritual Problem." "A fascinating and illuminating work." I am sitting up in bed, as I have for the last sixty consecutive nights, my heart hammering and my mind overrun with accelerating dread. Another night of hell. As usual, I am struggling to remain present, struggling not to let the reality of the dread engulf me. A dimensionless black pit of primal panic pulls at me, pulls and pulls, eerily sentient and far too close, its jagged electricity worming through me. Variations on a single theme keep campaigning for what remains of my attention: No more terror. I cannot endure any more. And yet here it is, apparently immune to meditative practice and cathartic discharge — breath awareness, awareness of body and mind, prayer and pranayama, Vipassana and Dzogchen, bodywork and yoga and running and relaxation practices, raw emotional release, psychospiritual insight, tears and tears and deeper tears, providing at best a sporadic, extremely fragile relief. Short-lived interruptions of terror. A deeper imperative than just being aware of whatever constitutes the dread seems to be addressing — or calling — me. It's as if the dread is pulling me to itself, sucking me into its dark enormity, its sickeningly bottomless vortex. Already I am leaving the level, the steady, the familiar, yet somehow keeping some attention on my breath, my body, my shaking body. I cannot stop the vibrating and jerking. Admitting to myself just how scared I actually am only intensifies my terror. I cannot help noticing that the dread seems to possess an intrinsic depth that effortlessly magnetizes my attention. I am closer than close to the horrifyingly unbearable — hypervividly experienced on previous nights — as I "descend," sometimes step by vertiginous step, sometimes blindly spinning and falling, working very hard to not give free rein to my wildly panicking mind. A gigantic no-exit madness surrounds and threatens to completely fill me. A horizonless insanity. The movement of my attention is far from straightforward — it is dizzyingly irregular, complexly angled and involuted, wide then narrow then wide again, as if passing through a maze rather than a chute or corridor. An oscillating maze at once claustrophobically contracted and freakily expansive, housing a boomeranging focus. The fear of insanity is overwhelming. What I am entering is a topography that won't lodge in memory. All that connects me to the world I've left is an extremely thin strand of attention, an Ariadne's thread of remembrance. A spectral filament linking me to a glimmer of basic sanity. A storm-crazed kite gone spelunking am I, tied ever so slightly to a fleeting semblance of solid ground. Like Theseus descending into the Cretan labyrinth, I too am on my way to face — or to more fully face — what I dread, already feeling the breath of the Minotaur. But, unlike Theseus, I am not doing so deliberately, and I am not armed. The terror intensifies. if I tug on it, as if to secure more of it, I find myself gripping nothing, except the memory of those few times when such a strategy has jerked me back up to the surface, "safe" but still stuck, like dreamers who, reentering the so-called waking state, have merely fled their nightmare and its dark treasures. My dread is now unmasked terror, staggeringly powerful. Nothing can stand in its way. My thread of remembrance? It's somewhere behind me, its crazily fraying ghost sinking in warped chasms that elude attention. Insanity. Explanations balloon into sight, then dissolve or mutate into something ungraspably other. Escape is now terribly attractive, but I've no line on which to tug, no cord of connection into which to breathe life. There seems to be only this unperimetered, amorphous monstrosity all around me, ready to swallow and obliterate and possess me. No, not ready — it already has. Within and without. Intimations of a horror beyond horror invade me from all directions. There is a tidal thunder in the distance, a strangely sibilant surf-like roar. It is, I have to keep reminding myself, the de-familiarized sound of my own breathing. Reference points eddy and shatter before I can find any anchoring through them. I am anchored elsewhere, in what appears to be a no-exit realm. I am very lost. The life I had before all this started is less than a dream now, its fleeting shards of memory only reminding me of how very far away I am. My mind rides the slopes of my previous life like an escaped sled with an accelerating black avalanche a microsecond behind.